Just like humans, pets’ teeth need looking after too. The health of their teeth and gums has a significant impact on their overall quality of life. Imagine how your mouth would feel, and smell, if you never brushed your teeth. Imagine having a really bad toothache and not being able to tell anyone about it! If teeth are not regularly cleaned, food particles, bacteria and saliva build up, forming plaque on the teeth. Plaque sticks to the tooth surface above and below the gum line. If not removed, it will calcify into tartar (also known as calculus). This appears as a yellow-brown hard material on the teeth. Over time the bacterial infection in tartar causes irreversible changes to occur. Without proper preventive or therapeutic dental care, plaque and tartar build-up leads to periodontal disease, which affects the tissues and structures supporting the teeth. Periodontal disease can cause oral pain, tooth loss and even heart and kidney problems. If your pet is showing any of these signs of dental disease, please book an appointment to see one of our veterinarians. Early assessment and action can save your pet’s teeth. Feed pets special dental diets or raw meaty bones. This can help reduce the accumulation of tartar. Use dental toys, enzymatic chews or teeth-cleaning biscuits to help keep the teeth clean. It is the same as a scale and polish done by a dentist for us. However, unlike us, our pets won’t sit still or open their mouth to allow a comprehensive cleaning of their teeth. For this reason our pets need to have a general anaesthetic for a professional dental clean. Your pet will need to be assessed by one of our veterinarians. The degree of dental disease will be assessed to determine if extractions, antibiotics and anti-inflammatories will be required. The assessment may also include a physical exam, blood tests and urine tests to ensure they are healthy prior to having an anaesthetic. Once anaesthetised, we can give the teeth a thorough cleaning using our specialised dental equipment. 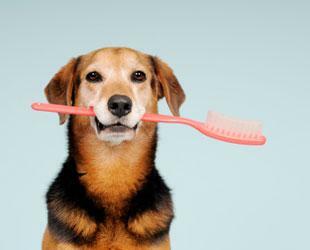 When your pet goes home, we'll discuss methods of reducing dental disease in the future. If you have any questions about dental care or professional dental cleaning, please do not hesitate to contact us.